New phones come with a great feeling. Be it a Blackberry, Tecno, Infinix, Samsung, Asus, iPhone or any of those numerous brands out there, you feel it’s the magical device that answers all your prayers. But two years later you can’t even pay someone to steal your old smartphone from you. Then, that yearning creeps in; the desire for a new and possibly, a shiny, top-of-the-line device. Do you know that you can simply exchange, swap, or trade-in your old phone to get a brand new device in Nigeria? Sometime last year, Nigerian leading phone retailer, Slot Systems Limited in partnership with Matrix Certified Pre-Owned Nigeria Limited, a leading name in pre-owned devices launched a “trade-in” program to enable customers trade-in their old phones for brand new ones. This was followed by MTN Nigeria with the Matrix Trade-in services. There are several reasons to exchange, swap, or trade-in your old smartphone to get a brand new device. You have done your best possible to preserve your phone’s newness for as long as possible. You did everything you could to protect it from rain, scratches, spills, thieves, children, and careless friends. But a couple years in, your once-beautiful phone is now a mass of scratches, dings, and dents, and you’re counting down the days until you can trade it in for a newer model. You no longer bother with the bulletproof case—or any case at all—and you could care less if your phone falls in the toilet. Also, Google launched it’s latest mobile operating system, Nougat but old phones will never know what it feels. Not to mention tons of apps which are available on Google store and other marketplaces that do not support versions old phones are running on. Now, the question is how to exchange your old phone for a brand new one? You can either use the Slot systems trade-in-program or MTN Matrix Trade-in. Know your trading value: How much does your old smartphone worth? Find out from SLOT. Trade-in your old phone: You’ll be asked to complete a simple form that simply captures the information that best describes the condition of your phone. ID card and proof of ownership. Get a voucher: You’ll be able to redeem this voucher based on the value of your item. Redeem your voucher: You can add more to the value of your voucher depending on the cost of the phone you want to take home. Which Slot Outlet Should I Visit? Or any other SLOT outlet closer to where you reside. Meanwhile, sources at the Ikeja head office of Slot, disclosed that customers can exchange their old phones in any of the Slot’s shops irrespective of where the product was purchased including their competitor’s shops. All you need to do is to present a copy of their identity card to authenticate ownership. 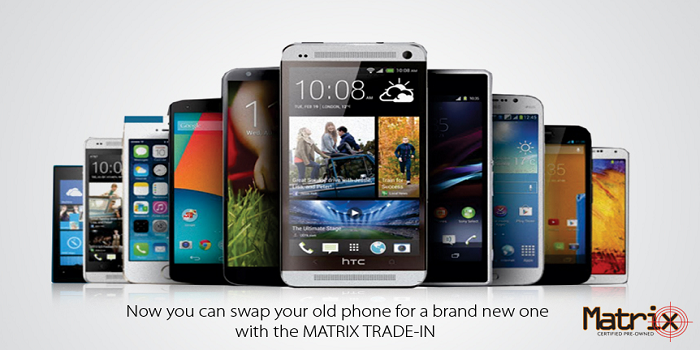 You can now SWAP your old phone for a brand new one or pre-owned with the MATRIX TRADE-IN. Simply walk into any of the designated MTN stores listed below, hand in your old Blackberry, iPhone, Samsung, Nokia, HTC, Infinix or Tecno phone in good condition and pay the price difference to get yourself a brand new phone. Select any available device of choice. Where can i trade my old phones for a new one? Visit the listed MTN stores to trade- in your old phone today. Pre-owned phones that are Matrix certified. Bottom line is, everyone can now fulfil their desire to own state-of-the-art phones at affordable prices. Instead of leaving your old phone to rot, take the step and swap it to a smartphone that support the new trend, 4G LTE. Samsung Galaxy S8 And Galaxy Note 8 Smartphones Coming Soon!